Ace director S.S. Rajamouli’s big budget magnum opus, Baahubali – The Conclusion, is getting ready in Ramoji Film City. In the same sprawling studio complex, Natural Star Nani is shooting for his upcoming film, in Virichi Varma’s direction. The actor happened to go over to the sets and he was congratulated by the team of Baahubali for his success. He then proceeded to direct a fun shot in the film and Team Baahubali posted this photo on its Snapchat account. 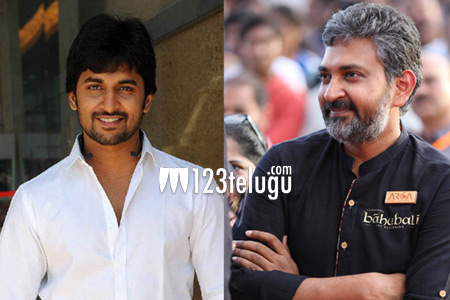 Nani shares a very good rapport with Rajamouli’s family as well as with producers Shobu Yarlagadda and Prasad Devineni.